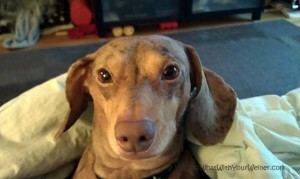 We are watching two of our Adventureweiner friends, Charlotte and Ludwig, over Christmas. Their Mommy and Daddy dropped them off yesterday and the mischief immediately started at our house. Shortly after they arrived, two of our other Adventureweiner friends, Rufus and Porter, came over to play. We wanted to tire the dogs out (like that is possible with a Doxie) because afterwards we were headed off to another adventure – Pictures with Santa! Now, this was no ordinary “pictures with Santa” experience. This was more like one of those really extreme adventure races that include mud and obstacles. First, it was POURING down rain. We had to park about a quarter mile away from where we were going and walk. Well…MOST of us walked. To be more specific, my friend walked her two Doxies and Gretel. I walked Chester and Ludwig but had to carry Charlotte. I don’t know if it was because I was a stranger or it was raining (likely the latter) but she would not budge. Putting it delicately, she a little fluffy and felt like she weighed 100 lbs by the time we got to where the pictures were being taken. SO….about where the pictures were taken: There is this bar in Seattle called Norm’s. It’s pretty much the only bar in town that is openly dog friendly. I mean REALLY dog friendly. The place is always packed and there are at least as many dogs as people. Santa was sitting in the back of the bar. The way to the back of the bar is through a 1-foot wide passage between the bar stools and a railing. Besides being a passage way, this space is also filled with waiting pooches and people (mostly with big dogs) trying to come the other way. We were the first in line when we first got to the back. However, there were a lot of big dogs sitting at a table adjacent to the line and we were immediately surrounded by other people and dogs that came for their Santa pictures too. So here my friend and I are trying to rally all 6 Doxies into a pack and surrounding them like basketball players trying to block a shot. We took pictures of each pair of dogs separately. At any time, one of was playing solo defense to 4 Doxies while the other one ran two of them over to Santa’s lap. For the last picture we tried to get all 6 at the same time but my friend and I had to sit in the picture to make it work. I am not sure the ones with the 6 of us turned out. The way back to the car was the same – lots of rain, mud and the carrying of fluffy Doxie. Usually I try to try off the dogs before putting them in the car when they are wet but I didn’t even bother this time. I haven’t looked at my car this morning but I am sure it is trashed. So in the end, the question was “are we having fun yet?”. These things always seem like an awesome idea until you are trying to execute the plan. It was a fun adventure (more like the second kind of fun – fun when you are looking back on it) and I can’t wait to see (and share) the pictures. Not your usual adventure at all. Getting all those Doxies to the right spot through the gauntlet of dogs and people sounds quite challenging. Hope the pictures are wonderful – look forward to seeing them. My blue eyed double dapple Dachshund Danny Quinn (tweenie) always wants to go for a walk, uses his charms and eyes to get volunteers to take him; I warn them, ala Doxie, he will only go so far, then keel over, “unable” to take another step. They smile, walk off and on return, I see DQ being held in someone’s arms (and he is not fluffy, just lazy). Merry Christmas! After all that, I really hope the pictures all come out awesome. You’re very brave indeed. LOL sounds like an adventure for sure! Sounds like Charlotte had the best time of all – she didn’t have to get her paws dirty. Smart girl! I’m sure the pics will be great though, and worth the effort. Gosh, and I worry about the chaos of my one dog, can’t imagine trying to make it all work with six! I hope the photos are great and make it all worthwhile. I wish I was up on the sofa playing with you guys too!! I can’t imagine trying to take all of those dogs to see Santa. Kudos to you. Cute video! We wanted to let you know that there are plenty of wonderful dog friendly bars in town. The Pine Box, Summit Public House, Shorty’s, Beveridge Place and Fremont Brewing are a few we frequent. Granted, none are named after a dog like Norm’s but it is good for both humans and canines to mix up watering holes! Thanks for the tips. I have never heard of the Pine Box. I plan to visit the Leary Traveler in the next week or so. Wow you are brave. We hope the pix are great. Have a super Saturday.